Moco Comics » Atomic Laundromat, Tall Tales and SDCC’10! Atomic Laundromat, Tall Tales and SDCC’10! I’m back from San Diego, and learned a lot! But well, first things first, please go visit Atomic Laundromat, webcomic by my pal Armando Valenzuela. It’s great and hilarious, you’ll gonna love it! Besides, Armando is the one responsible for the translation from spanish to english of this ver comic, Patote! He surely does an amazing job! So go visit him! One of the best things of Comic-Con at least for me, was the opportunity to meet Jeff Smith in person! He’s great and signed my copy of his new book: Tall Tales (Scholastic, 2010). 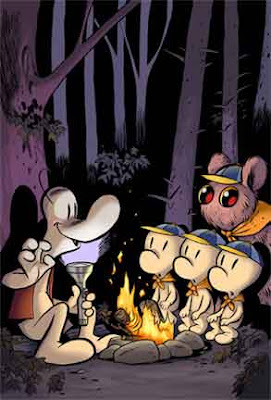 This is kind of a prequel, showing Smiley Bone with a group of young scouts, telling them legendary stories of Boneville’s origins and of their national hero Big Johnson Bone the founder of Boneville. It’s a great book, you’ll love it, and I’m looking forward to the next Bone adventures coming up in 2011. Besides, Jeff Smith hosted the first panel of the Con, and he talked about his current sci-fi adventures series, RASL. He also read some pages from Tall Tales, it was awesome! I really loved this experience, I met Scott McCloud too! He’s a great guy and really inspires you to make better comics! I gave both Jeff and Scott, among other artists, a copy of some Patote comic strips! See more photos at te Facebook Fan page! No this is not Scott McCloud, thanks heavens… this is one of many other photos you can see at the Moco Comics Facebook fanpage. Just click the photo and you’ll be there, join the page for more exclusive content from my comics!